Patna, March 27 (IANS) They are Bihar's seasoned politicians, popular faces, star campaigners and real vote catchers of their parties, who are not contesting the Lok Sabha polls. 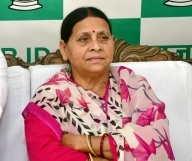 Prominent among these personalities are ruling JD-U president and Bihar Chief Minister Nitish Kumar, senior BJP leader and Deputy Chief Minister Sushil Kumar Modi, Leader of Opposition Tejashwi Yadav, RJD leader and former chief minister Rabri Devi, LJP chief and Union Minister Ram Vilas Paswan, as well as Congress leaders Madan Mohan Jha and Akhilesh Kumar Singh. Apart these, jailed RJD chief Lalu Prasad figures in the party list of star campaigners, and party leaders are hopeful that Lalu will get bail from the apex court and can join the campaign. The former chief minister cannot contest the polls as he has been debarred by the court following conviction. All these star campaigners are not contesting the polls this time, but there are some exceptions. Grand Alliance ally, former chief minister and Hindustani Awam Morcha president Jitan Ram Manjhi, who is contesting from the Gaya Lok Sabha seat, RLSP chief and former Union Minister Upendra Kushwaha Vikasheel Insaan Party (VIP) chief Mukesh Sahni are both likely to contest. Besides,Chirag Paswan, son of Ram Vilas Paswan, who is also a star campaigner is likely to contest from the Jamui seat that he won in 2014. Chirag's LJP is partner of the NDA. Both Nitish and Sushil Modi have been working overtime with their party leaders to finalise the poll strategy to ensure the victory of the NDA candidates from all the 40 Lok Sabha seats in Bihar.T he JD-U leaders have repeatedly claimed that Nitish is the brand and face of NDA in Bihar. Similarly Sushil Modi, who is locally known as 'Sumo', is leading the BJP campaign and regarded as one of the main faces of the party. JD-U leaders said Nitish Kumar has not contested elections since 2004. The last time Nitish contested the Lok Sabha elections wa from Nalanda in 2004. However, since the 2005 assembly elections, Nitish has not contested any election but has entered the state assembly through the Upper House by becoming a Member of Legislative Council. Sushil Kumar Modi has also not contested any elections since 2005. He is a legislator of the Bihar Legislative Council. According to sources in RJD, Lalu is actively monitoring party activities currently from his hospital room. "Laluji played an important role in finalisation of seat sharing of the Grand Alliance and also given tips to Tejashwi to focus on certain issues during the polls to consolidate the party social support base", a source said. Although Rabri Devi is not in the fray, she is also busy meeting party leaders and workers at her official residence here. She will join the campaigning soon, he added. State Congress president Madan Mohan Jha, Congress campaign committee chairman Akhilesh Singh Choudhary and JD-U state president Vashisht Narain Singh are also not in the fray this time. As per the NDA's seat-sharing formula, BJP and JD-U will contest 17 seats each, while 6 seats will be contested by the LJP. The Grand Alliance, last week, announced a seat-sharing pact in Bihar under which the RJD will contest 20 seats, the Congress 9, while smaller parties like Upendra Kushawaha's Rashtriya Lok Samata Party will contest 5 seats, and HAM as well as VIP will contest 3 seats each.